Hello November! I am so excited a fresh new month is here and all of the holidays are just around the corner! But first, a recap on all the best bits October brought to my makeup bag. Mascara Duo - Too Faced Lash Injection & Maybelline Lash Sensational : The Maybelline Lash Sensational mascara was actually featured in last month's favorites (and it appears again because it's just that good). However, this month I've been pairing the Too Faced Lash Injection with it. I've been using the Lash Injection almost as a primer of sorts. It's the type of mascara that forms little tubes around the lashes to help add volume and length. It's also a very flexible, soft formula that doesn't cake/flake on the lashes. I really feel like this helps to form a protective layers over my lashes before applying a more dramatic, intense waterproof mascara. I also love Lash Injection on it's own for a more minimal "no makeup, makeup" day. NARS Radiant Tinted Moisturizer : I scooped this up while in New York at the beginning of the month and used it exclusively up until about two weeks ago (when I switched to Sheer Glow). The formula is hydrating, lightweight, and can be built up easily for a bit more coverage. Like all NARS foundations it gives an excellent "glow from within". NARS Sheer Glow : Do I even really need to talk much about Sheer Glow with it being such a cult classic?! This is one of my most reached for during the cooler months since it gives a bit more for a semi-matte finish in comparison to my CC creams and tinted moisturizers. It has a fantastic your skin but better finish and a medium coverage (perfect for the cooler months). IT Cosmetics Heavenly Luxe Buffing Brush #6* : This brush has been my everything since it landed in my hands. I prefer it to any other brush and also my hands (even for tinted moisturizers and CC creams). It does such a flawless job of buffing and blending out product and keeping the skin natural looking. CND VinyLux Weekly Polish in #105 Black Pool : I recently ran out of my favorite OPI Black Onyx polish and when I went to replace it I couldn't find it anywhere. Target and Ulta were both out of stock and so I ended up scooping up this CND version. The CND brush is nice and wide (like OPI) and the formula lasted on my toes for quite some time (much longer than a week). I paired this with my Seche Vite base and top coat. Becca Cosmetics Ombre Rouge Eye Palette : Saving the best for last! This palette. 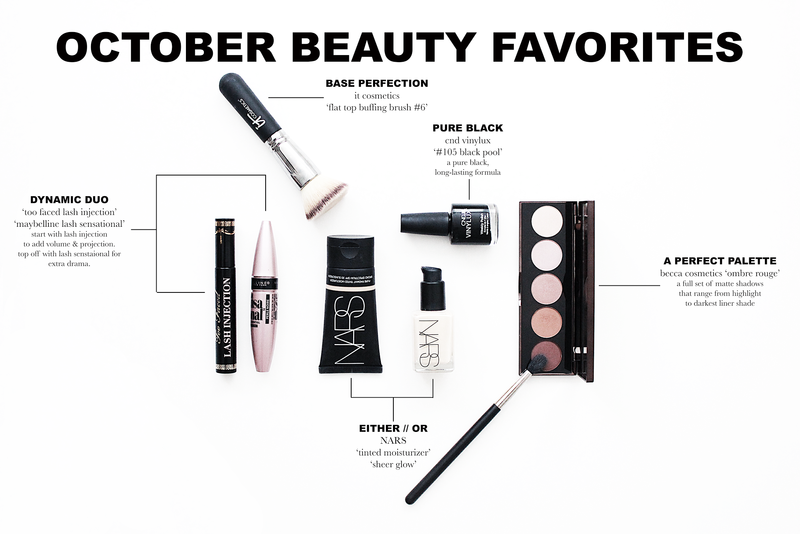 Hello gorgeous, matte, warm, neutrals. The formula is super buttery, very pigmented, and very easy to blend. Becca is most known for their highlights, but this palette has me wanting to try lots of other options from the brand.